It takes the average single homebuyer 11 years to save a 20 percent down payment for a median-priced home. That’s over double the time it takes for a married couple, according to a new Zillow analysis. The inventory for starter homes has decreased by 18 percent, Zillow says, meaning that single buyers can only afford 45 percent of the U.S. housing stock, compared to married or partnered couples who have dual incomes and can afford 82 percent of all homes. The disparity only greatens when looking at large, high-priced metropolitan areas such as San Diego, Sacramento and Portland. In San Diego, it would take a single buyer making an average income of $46,100, 22 years to save for a 20 percent down payment on a $234,123 home — the maximum amount they could reasonably afford. Meanwhile, it would take a married couple making an average of $93,000 only 11 years to save for the down payment on a $471,840 home. In Sacramento and Portland, singles can only afford less than 10 percent of houses on the market, while married and partnered couples can afford over 70 percent of homes in each of those markets. Also, in both markets, it would take singles nearly 17 years to save a 20 percent down payment — 10 years more than it would take for a couple. On the other hand, singles in Indianapolis have it the best, with an average down payment savings time of 7.5 years, and 71 percent of the market in financial reach. “Nearly two-thirds of Americans agree that buying a home is a central part of living the American Dream, but for unmarried or un-partnered Americans, that dream is increasingly out of reach,” said Zillow senior economist Aaron Terrazas in a statement. 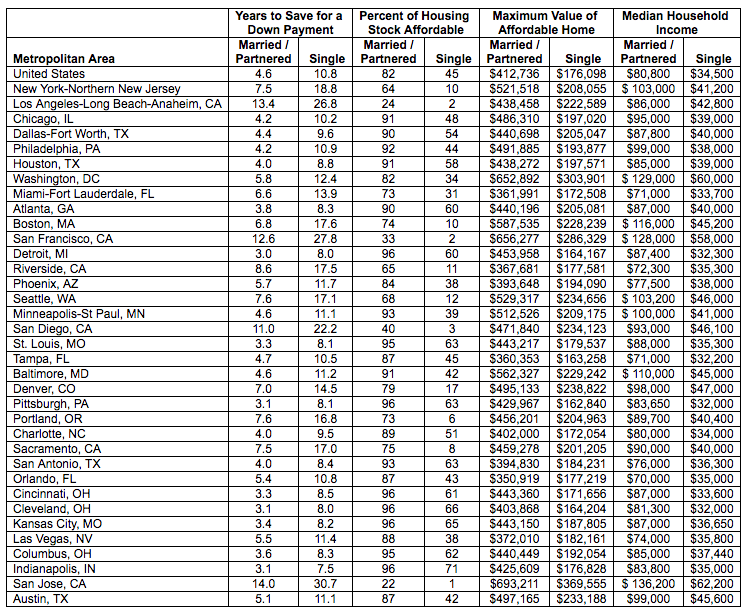 Single homebuyers in San Jose have the longest wait — 30.7 years. But one thing homebuyers should keep in mind is that the requirement of a 20-percent down payment is thought of as a “myth” now, and numerous programs are available for people unable or unwilling to spend that much cash up front.